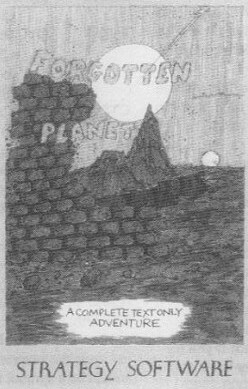 Forgotten Planet is an "all-text" adventure game with detailed descriptions of a large number of locations. Thus, your imagination is left free to conjure up the scenes in your mind rather than relying on screen graphics which in many graphic adventures offer no extra clues anyway. The game uses the full memory of the Amstrad so there are plenty of locations to explore, objects to examine and use, and puzzles to solve. Initially you are inside a crashed space pod on the 'forgotten planet' and your task is to get out of the pod without killing yourself in the process, survive on the planet's surface (interpreting a clue given in one of the engravings will probably prove essential if you are to survive long enough), and find a means of escaping from the planet. This is far from being an original theme, but I am sure you will find many of the puzzles challenging and the game's responses of good standard with the occasional dash of humour. Rumour has it that this planet was settled only after humans discovered the secret of survival in what appears to be an unbreathable atmosphere. The resources of the planet were depleted after aeons of settlement and the human inhabitants apparently left to develop some other world. It is recorded in the Encyclopaedia Galactica that a great trading planet existed in this area up to about 1000 years ago. The people of this planet built their space ports in well-camouflaged situations to discourage visitors. All these space ports were meant to be destroyed when the planet was abandoned. A later report in Hogan's "Abandoned Planets" stated that investigations had revealed that one space port remained intact. It was left in case of emergency for use by any returning group of the planet's inhabitants. You had only taken an idle interest in these facts and rumours, not realising how useful it would have been to have made a detailed study of the history of the planet. Little did you realise that your life would one day would depend on your ability to survive on this planet long enough to find the hidden space port and use the ship left there -providing, of course, that it is still operable after so many years. PLAYING THE GAME The method of communicating with the game is fairly standard and as a general rule you must use two words. Compass directions may be abbreviated and the letters L and I used for LOOK and INVENTORY (used when you want to know what items you are carrying). The game will act on your command if it understands, display its reaction, and the prompt will reappear awaiting your next input (if you are still alive!). If the computer does not understand your command, re-phrase it. The game has a good vocabulary but is limited by available memory and you have to think like the programmer sometimes to come up with the correct word. If you wish to stop playing and not continue from your present position you simply type QUIT. This provides the chance to start another game - a good feature not available on all adventures. Even more useful is the SAVE command - this will save the current position and the results of all your adventuring so far. The game provides the necessary prompts to use this routine and it takes only a few seconds. All adventure games should have this feature and it is essential in Forgotten Planet for two reasons: a) you will probably (certainly!) not finish the game in one sitting and when resuming play, you will not reed to retrace all your previous wanderings; and b) if you are about to take a dangerous step, you can save the game just in case you get killed (or worse!). To resume a saved game you can just type LOAD and follow the on-screen directions. After you have restored the game, type L (for LOOK) for a description of where you are and I for INVENTORY. Typing SCORE at any time will give you your current score out of a possible 400 points. You score points for finding useful items - though in some cases points are not awarded until you have made use of the object to solve some problem or puzzle. Be warned, there is at least one object in the game that must be used in two separate locations to solve problems and it is possible to damage an object so badly that it cannot be repaired for later use. There is a penalty if you get yourself killed - the game finishes! 1. Draw a map of your wanderings (!) - this helps to avoid getting lost and also you can quickly retrace your steps to a previously visited area if you discover that an object found in one place is required to solve a problem in another place. If you drop an object record its location in case you need it later. Remember there are 10 possible directions and in some situations ENTER, OUT, CLIMB UP or CLIMB DOWN may apply. If an object can be taken then it probably has some use in the game. Some objects cannot be taken until some puzzle has been solved - in Forgotten Planet you will find an eagle and a strange creature called a Treliod both prove to be considerable nuisances in this regard. Read the descriptions carefully as well as any engravings, carvings, etc. It often pays to EXAMINE items mentioned in the description. There may be some areas where your route may twist and turn and you may find that having gone east you cannot return to your previous location by going west!